Milner Craft Series has a new book out (as of March, 2008), called Floral Interpretations for Silk Ribbon, by Helen Dafter. I’ve just had the pleasure of perusing the book, which is a great resource for embroiderers interested in silk ribbon embroidery. So here’s a review, with indications of what’s in it, and what I like about it. Whether you like silk ribbon embroidery for accenting crazy quilts, or you use silk ribbon flowers to embellish paper embroidery, or you dabble with silk ribbon to make articles for home decoration, the book Floral Interpretations for Silk Ribbon would be right up your alley. True to the format of the Milner Craft Series books, you’ll find all the useful background information on essential embroidery supplies, techniques, pattern transfer, and so forth at the beginning of the book. For the stitcher new to silk ribbon, there’s a good bit of information on different types and sizes of ribbon and what they can be used for. You’ll also find a good stitch dictionary for the various silk ribbon stitches employed in the book, as well as for regular embroidery stitches that accent a silk ribbon piece. But, as usual, what I find most enticing are the projects! 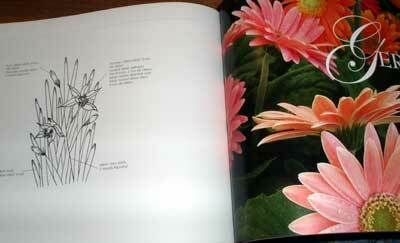 In this book, they are arranged according to flower. You’ll find projects for all kinds of flowers: lavendar, violas, grape hyacinth, gardenias, daffodils, gerbera daisies, camellia sasanqua (new one to me…), cornflower, flannel flower, roses, crab apple, and daisies. 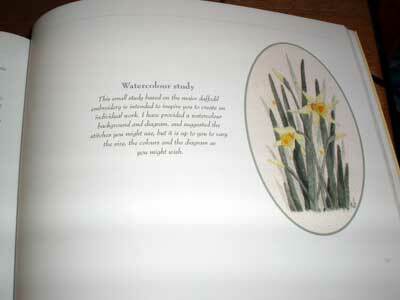 In each project section, you’ll find a general blurb about the flower, as well as a watercolor interpretation of it. The watercolors are very handy, because it gives you a sense of the shading, position, placement, growth pattern, and artistic look of the flower. 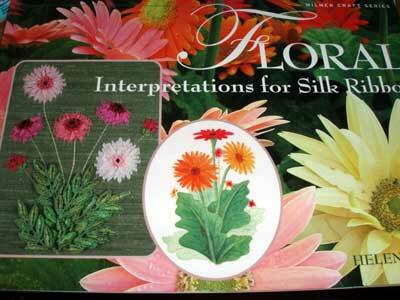 You’ll also find information on what stitches are used to produce a realistic flower using silk ribbon. You’ll also get a photo of the finished project. I love seeing photographs of finished pieces when I’m working on something – they give an invaluable guideline for producing what you’re trying to produce! And, of course, you’ll also find the pattern for the piece, in a black and white line drawing suitable for tracing. Again, the projects are arranged according to flower, rather than according to ease of work. I think that’s ok, though. The book is thorough enough to give the beginner a good resource to learn the techniques, and at the same time, it’s diverse enough to enchant the expert with inspirational material! Even though I don’t use silk ribbon too often, I’m always thrilled when I finish a silk ribbon project. My most recent venture in silk ribbon was this little box decorated with silk ribbon embroidery, and other than that, I’ve done several greeting cards and other little pieces over the years. I’ve also used silk ribbon as accents on different embroidery pieces, like notebook covers and whatnot. Do you want to know what I like best about silk ribbon embroidery, though? (Besides the fact that I think it’s really pretty?) … it’s the fact that silk ribbon works up fast! With relatively few actual stitches, you can produce the item you’re embroidering and see very quickly a finished piece coming together. A whole petal, or a stem, or a leaf, might just take one stitch! I love that! What I like about this book is that it takes silk ribbon beyond just the basic quick stitching to a whole new level of realistic and beautiful interpretations of flowers – perfect for filling out any stitcher’s repertoire! So, if you like the idea of playing around with silk ribbons and trying out some pretty stitches for pretty results, take a look at Floral Interpretations for Silk Ribbon by Helen Dafter. 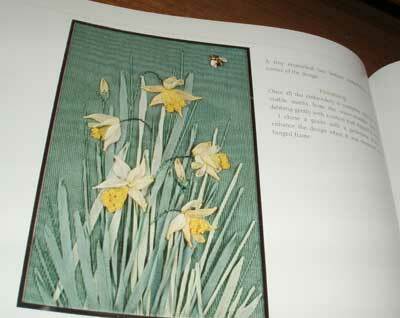 The book is distributed in the US by Sterling Publishers, who produce a wonderful array of craft and needlework books. You can pick up the book through Amazon for less than $15, which is about $5 less than the publisher’s price. I think the best embroidered flowers are made with ribbons. I want to learn ribbon embroidery and bought many books on the subject in the past. Sometimes I was disappointed: the projects were quite ugly, not something I would like to learn to do. But you enticed me with this book, I could not help myself and ordered it. I am looking forward to its arrival and would love to read more reviews of ribbon embroidery books in your blog. Thank you. I received the book yesterday and I am not very impressed. 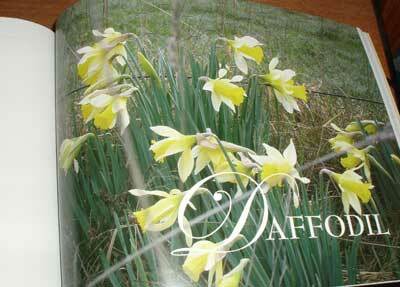 While daffodils are quite nice, most flowers presented in the book have little resemblance to real flowers. Especially I was disappointed with cornflowers. Having looked through multiple books on ribbon embroidery, I would give this book 3 stars. However, I am still glad I got it. This is the book I learned “extended ribbon stitch” from. Most books do not include this stitch in their stitch library. I have not read entire book, I might learn something else from it. But I decided not to buy 2 other books by this author which were in my wish list. My favorite books on the subject are A-Z Ribbon Embroidery by Sue Gardner, Ribbon Renaissance by Helen Eriksson and A-Z of Silk Ribbon Flowers by Ann Cox. Previous Previous post: Free Pattern: Monogram for Hand Embroidery – The Real C!